Top left: Palace des Nations, Middle left: CERN Laboratory, Richt: Jet d'Eau, Bottom: View ower Geneva an the lake. Geneva (Arpitan: Genèva, IPA: [ˈd͡zənɛva]; French: Genève, IPA: [ʒənɛv]; German: Genf, IPA: [ˈɡɛnf] ( listen); Italian: Ginevra; Romansh: Genevra) is the seicont-maist-populous ceety in Swisserland (efter Zurich) an is the maist populous ceety o Romandie (the French-speakin pairt o Swisserland). Situatit whaur the Rhône River exits Lake Geneva (in French an aa kent as Lac Léman), it is the caipital o the Republic an Canton o Geneva. 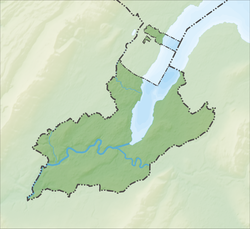 While the municipality itsel (ceety centre ville de Genève) haes a population o 191,415 (2010), the canton o Geneva (République et Canton de Genève, which includes the ceety) haes 457,628 residents (2009). The agglomeration haes 1,240,000 residents but the Greater Geneva agglomeration (Geneva-Bern aurie) haes got 2,800,000 residents. Geneva is a global ceety, a financial centre, an a warldwide centre for diplomacy an the maist important internaitional co-operation centre wi New York acause o the presence o numerous internaitional organisations, includin the heidquarters o mony o the agencies o the Unitit Naitions an the Reid Cross. It is an aa the place whaur the Geneva Conventions wur signed, which chiefly concern the treatment o wartime non-combatants an preesoners o war. Geneva haes been describit as the third European financial centre efter Lunnon an Zurich, an the warld's aicht maist important financial centre bi the Global Financial Centres Index, aheid o Frankfurt an Sydney, an a 2009 survey bi Mercer foond Geneva tae hae the third-heichest quality o life o ony ceety in the warld (narrowly ootranked bi Zurich). The ceety haes been referred tae as the warld's maist compact metropolis an the "Peace Caipital". In 2009, Geneva wis ranked as the fowert maist expensive ceety in the warld. The name Geneva is probably o Celtic oreegin. The ceety wis mentioned in Laitin texts wi the spellin Genava. The name takes various forms in modren leids. Thus, it is Geneva in Inglis an pronounced /dʒɨˈniːvə/ (deprecatit template), French: Genève [ʒənɛv], German: Genf [ˈɡɛnf] ( listen), Italian: Ginevra [dʒiˈneːvra], an Romansh: Genevra. Anither theory is that Geneva is derived frae "Genévrier" which is the French wird for "juniper". Thare is occasionally confusion atween this ceety an the Italian port o Genoa (in Italian Genova) as thay seem tae share a Celtic root, genu / genawa, meanin "estuary." The ceety is dividit intae aicht quartiers, or destricts, whiles componed o several neighborhuids. On the Left Bank are (1) Jonction, (2) Centre. Plainpalais, an Acacias, (3) Eaux-Vives, an (4) Champel, while the Right Bank includes (1) Saint-Jean an Charmilles, (2) Servette an Petit-Saconnex, (3) Grottes an Saint-Gervais, an (4) Paquis an Nations. ↑ Paul Hofmann (1990-06-24). "Staying on the Safe Side; Geneva". The New York Times. The New York Times Company. Retrieved 2008-04-19. ↑ Finn-Olaf Jones (2007-09-16). "36 Hours in Geneva". The New York Times. The New York Times Company. Retrieved 2008-02-02. ↑ The City of London, ed. (March 2009). "The Global Financial Centres 5" (PDF). Archived frae the oreeginal (PDF) on 2009-10-07. ↑ Mercer's 2009 Quality of Living survey highlights . Last updated 28 April 2009. ↑ "MySwitzerland.com". MySwitzerland.com. Retrieved 2010-07-03. ↑ "Cost of Living survey 2010 - City rankings". Mercer.com. 2010-06-29. Retrieved 2010-07-03. ↑ "Districts of Geneva". Official website of Geneva. Archived frae the oreeginal on January 13, 2008. Retrieved 2008-02-09. Wikimedia Commons haes media relatit tae Geneva. This Swisserland-relatit airticle is a stub. Ye can help Wikipaedia bi expandin it.